What Is Friable Asbestos or Friable ACM? Asbestos Containing Materials or ACM, are divided into two categories, friable and non-friable. In this context, friable means the asbestos can be released into the air with minimal disturbance to the asbestos containing material. Unless the asbestos-containing materials (ACM) are thoroughly encapsulated (locked in) by a protective chemical coating or enclosed by a non-asbestos outer jacket, they are considered friable, or capable of being crumbled or reduced to a powder by hand pressure. 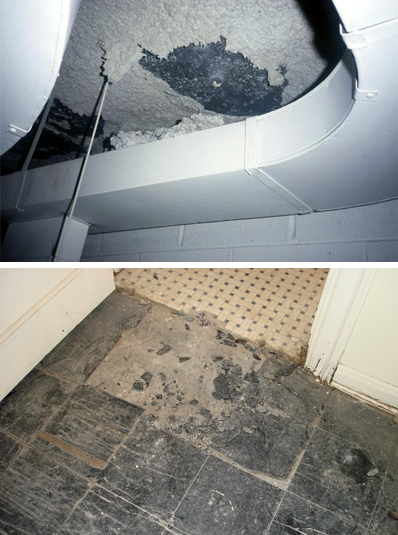 Friable ACM is therefore the most dangerous form of asbestos since the building materials can easily release fibers into the air upon minor physical disturbance, vibrations, or even air movement.